Holy contest Batman! 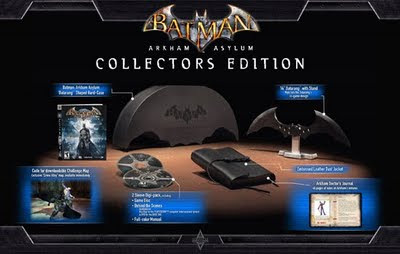 On the Playstation Canada website they have a brand new promotion where they are giving away five copies of Batman: Arkham Asylum Collector's Editions. It's simply enough to enter, just enter your name, location, email address and birthday. Voila, you're in. The draw will take place on October 7, 2009. For those of you who already have the game, they're also giving away 10 Batman: Arkham Asylum PS3 poster sets. I'm not normally too keen on posters but these are surprisingly cool looking. There are six poster images on the Playstation Canada website and five posters appear to feature one of Gotham's criminals. I can see Killer Croc, The Joker, Poison Ivy, Harley Quinn, and Bane. The sixth and final poster seems to be an ad for the exclusive Joker Challenge Maps. Damnit Batman, those posters look good.